These laces are such a great idea. I got some for my special needs son who has always had trouble tying his shoes and for my husband who is finding it harder to bend down. They are just what was needed. They are easy to use and look great. They work well - no loose ends - comfortable fit. They worked great just must sure you get the right size follow the guide. My mistake. I had bought some for my Nikes and loved them. I recently bought some for my son-in-law who lost the use of his arm in a motorcycle accident. He was frustrated because he wanted to wear his favorite shoes (not sandals or Crocs) and he could not tie them. Now he can not only wear his favorite shoes, but put them on without assistance. My husband has trouble managing shoe laces and these are making it so much easier for him! A great product; I hope they last. Make my shoes a slip on. These are great for my son with dysgraphia. Tying his shoes can be time consuming and difficult. These are super easy and look great! Couldn't believe I spent almost $20 for a pair of shoelaces, but ultimately, my husband does like them. My nephew is a teen with special needs and these are a great help. He no longer needs help getting his sneakers on and off. It is extremely difficult tracking down men's sized athletic sneakers that don't need to be tied. We all love these because it allows us to buy him fashionable sneakers and just swap out the laces. These were easy to lace in and are very durable. We no longer have to deal with those ridiculous toggles (ugly and uncomfortable) or stretchy laces that lose their elasticity almost immediately (which results in the kid's shoes falling off when he's running around). Extremely helpful when getting out the door! Because of an accident, tying shoelaces is impossible, so these laces are the best solution short of Velcro shoes (ugh!!!). 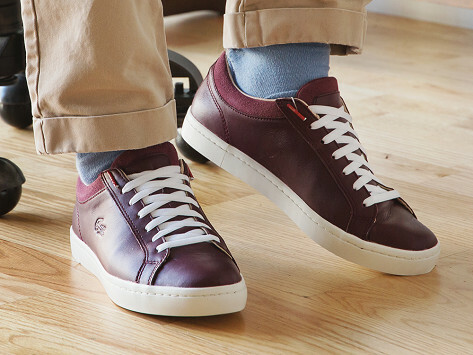 Swap in no tie shoe laces to transform any pair of laced shoes into pull-ons. Made with a stretchy Lycra and nylon blend, Laceez act and look like laces, but with a smooth finish—and no sloppy knots or dangling laces.